TimeTrak offers a variety of biometric and fingerprint clocking in machines with hundreds of payroll services including ADP, Paychex, Sage, and QuickBooks to name a few. Fingerprint clocking in machines or employee time clocks not only prevent “buddy punching” but can save your business time and money by eliminating payroll mistakes and costly time theft. Today’s time clock machines are incredibly efficient at verifying fingerprints even in the case of dry, wet, cracked, or even dirty fingers. Options include a cloud-hosted solution with a low cost per employee as well as an on-premise system with No Monthly fee. 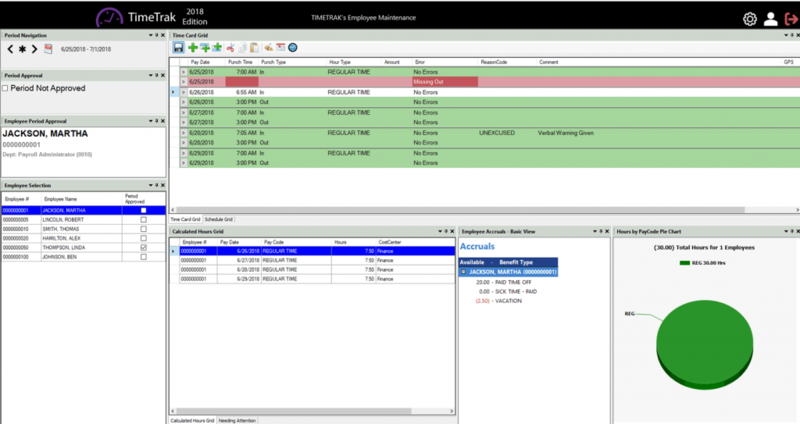 The fingerprint clocking in machine and software includes scheduling, exception tracking, automatically paid holidays, and numerous ad-hoc reports. A recent study indicated that 19% of employees admitted to “buddy-punching” – the act of clocking someone else in. A similar study conducted by the American Payroll Association found that buddy-punching accounted for 2.2% of gross payroll or about 4.5 hours per employee each week in some cases.